Washington (CNN) – Many people may have never heard of his name. And yet, he's considering running to become the leader of the free world. 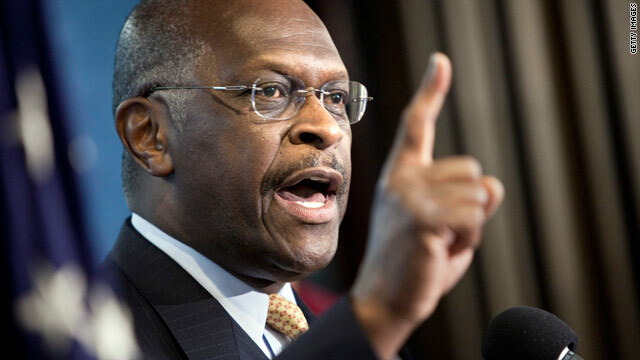 Herman Cain formed a presidential exploratory committee on Wednesday. Cain is a Republican and conservative radio talk show host who is also a favorite among many Tea Party circles. He is the former CEO of Godfather's Pizza. Cain told CNN: "People who say that Herman Cain has no chance of winning the nomination for the Republican Party or win the in presidency - I simply say thank you. Because all my life I have been in situations where I wasn't supposed to become VP of Pillsbury, I wasn't supposed to be able to turn Godfather's Pizza around. I wasn't supposed to succeed in climbing the corporate ladder in corporate America. So to the people who say I don't have a chance I say, thank you. Because that inspires me." Mr. Cain, I voted for you in 2004 in the senate primary, and I will support you again, sir. I pray to God that his committee will not get off the ground so America will be spared his right wing nut ideas!. Go away...............just what the Republican party needs is another freak. Sorry I ever ate at a Godfather's pizza. Anyone who can turn a pizza company around should be able to deal with national defense, Iran, South Korea, two unfunded republican wars, climate change, oil dependency, health reform, while being able to fix supper for the middle class, too. Why do the right continue to think running for the President is a game? Hey might as well form one of those committee also and run for president, crap every one and the mamma is gearing up. Just what this nation need another hill Billy that thinks the only thing that the modern government need to have is the ability to wage war, every thing else is hands off. It doesn't matter if the big corporations are seeking demand from other nations abroad because the waning demand from this country, and people dropping dead in the streets, because of lock of health insurance. We all should watch them die because this is what the constitution say. Pack up on your ammo and guns and go hunt deer and big games to survive, and no dependence on government programs. While watching Shannon Travis interviewing Herman Cain about his posable bid for the presidency of the United States of America, I felt so proud that we could consider another black man as our president of the United States of America. After the Herman Cain interview, Shannon Travis was 'throwing' it back to the CNN anchor and I was horrified when Travis pronounced the word 'ASK' as 'AX'. What a disappointment to hear a journalist make such a flub to an otherwise inspiring interview. Since there are about 30 HOPEFULS who want to be the republican candidate for president, have they reserved a football field as a place to have the debates. I seem to remember in 2008 when about 8 or 9 Democrats announced they wanted to be the Democrat candidate and the republicans laughed their heads off at the "crowded" field...gee wonder if they split their sides at the field of candidates for their side this time. Guess not. When republicans do it it's OK, it is just Democrats they love to demean and slur.